Seven fabulous books to cater to everyone on your gift list! We’ve all heard it before: It’s the thought that counts. I, for one, prefer not to give gifts just for the sake of giving. I actually do want to the person at the receiving end to like my gift. And during the holidays, this desire amps up the pressure to buy something special for each and everyone on my list. Even as I’m slowly checking people off my list, I thought I’d make your life just a little bit easier. A group of writer friends and I decided to organize a virtual potluck featuring great cookbooks perfect for holiday gift-giving. Whether you’re buying a Christmas gift for your sister-in-law or a hostess gift for your next holiday party, you’re sure to find a book beckoning to you in this lovely mix. Be sure to scroll right to the bottom where you’ll find blurbs about each book; click on the blog links for a full post plus a recipe. 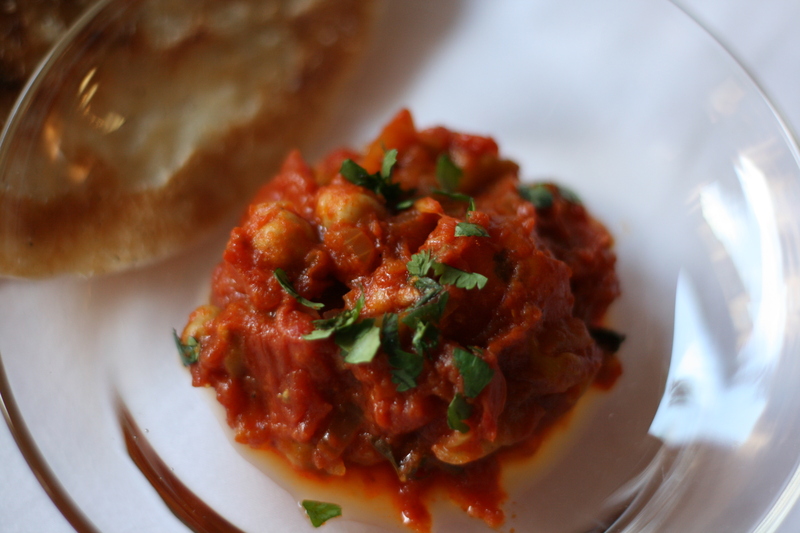 My contribution to the potluck is Chickpea Curry with Tomato and Mango from Roz Cummin’s blog. Roz is a food writer who focuses on sustainability, agriculture, fishing, and aquaculture, and has written for notable publications such as edibleBoston, Grist.org, and Culinate.com. She’s funny and articulate, and her stories (like her wonderful self) never fail to make me ponder, or laugh out loud. Her latest project promises to do both. Roz is working on a book charmingly titled: Golden Afternoons: The Official Handbook of the Society for the Preservation of Ladies’ Afternoon Tea. The book will include a contribution from me, so look out for it! Apparently, Roz came up with this recipe while tearing down the aisles at her local Whole Foods trying to figure out what to cook for her vegan co-op and a new, I’m-allergic-to-everything member (I’ll let you read her entertaining tale for yourself). The dish is easy to make and a fabulous mélange of sweet, tart, and spicy. Even though I’m still working through my Christmas list, at least I know what I’m making the next time friends come over for dinner on a cold, wintry day. The combination of sweet-tart Meyer lemon juice and sweet, fresh mangoes makes for a delicious modern take on an Indian curry. (Psst, you can also use dried mangoes snipped into strips as Roz does in her original recipe.) The Meyer lemon is thought to be a cross between a true lemon and either a mandarin or the common orange, and is not as sour as a regular lemon. Its floral fragrance and sweetish juice make all the difference in this curry. Warm the spices in a large pot over low heat until they become aromatic, about 1 to 2 minutes. They do not need to change color. Dump the spices onto a plate and wipe the pot clean with a damp paper towel. Add the oil and heat over medium-high heat until it shimmers. Add the chopped onions, followed by the ginger and garlic. Cook until the onions are translucent and the ginger and garlic are fragrant. They do not need to brown. Reduce the heat to medium and add the tomatoes. If you are using whole tomatoes, use a spoon to break them down. Toss in the mango. Cook for five minutes then add the spices. Add the chickpeas followed by the chili peppers, if using. Simmer the curry for about 30 minutes or until the chickpeas are slightly softened and completely warmed through. Take the curry off the burner. Throw in the lemon juice and stir. Taste the curry. Now add a pinch of salt and taste again. Correct the seasoning with more salt if necessary. When you serve the curry, throw some cilantro (see Pat’s note below) on top of each portion. Ask your guests to stir it into the curry. Serve with naan, paratha, or basmati rice. Pat’s notes: A grandmother I cooked with once told me not to chop cilantro leaves as the leaves would turn brown. Pluck them or tear them instead. Chock-full of delicious, creative, and easy-to-make recipes for everyday cooks, 100 Perfect Pairings makes food and wine pairing easy and approachable. With recipes organized into twelve chapters by wine variety, simply turn to the chapter for the wine you want to serve, make any of the entrees you find there, and enjoy it with your wine. It’s that easy. Be it Pinot Grigio or Pinot Noir, a big dinner party or a simple meal with friends, “100 Perfect Pairings” promises wonderful recipes that make every pairing, well, perfect! Jill Silverman Hough is a cookbook author, food and wine writer, recipe developer, and culinary instructor whose forte is making food and cooking simple yet special. Ideal for today’s conscientious carnivores, Almost Meatless is a timely new book featuring 60+ tasty recipes that go light on the meat. Without compromising flavor or protein, these dishes maximize health benefits while minimizing the grocery bill and impact on the planet. Tara Mataraza Desmond is a writer, cookbook author and recipe developer focused on food for health and wellness, pregnancy and parenthood. Brewed Awakening is Joshua M. Bernstein’s definitive take on the craft beer revolution. The book is the deeply reported story of the wild innovations and passions driving craft beer, focusing on the tales of the risk-taking brewers, bar owners and the dedicated beer drinkers across the globe. There’s a story in every pint glass, and Brewed Awakening gives voice to each one. Josh Bernstein is a Brooklyn-based beer, spirits, food, travel and bicycling (phew!) journalist, as well as an occasional tour guide. How do you keep a Dagwood from toppling over? How did the Hero get its name? And who invented the French Dip? Discover these answers and more in The Encyclopedia of Sandwiches—a chunky little cookbook dedicated to everything between sliced bread. 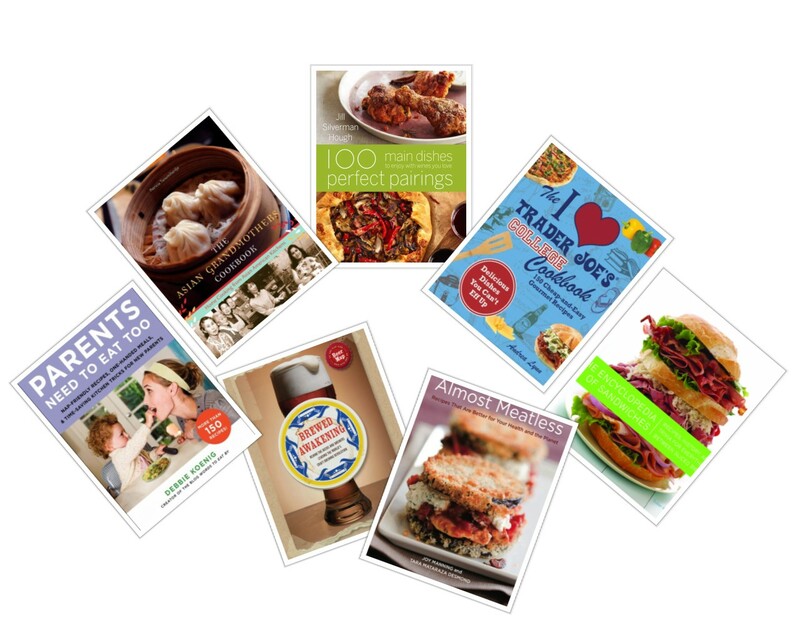 You’ll find recipes for every sandwich imaginable along with fascinating regional and historical trivia. From the humble Sloppy Joe to the chic Nutella sandwich, from the iconic Po ‘Boy to the fresh-faced donut sandwich, The Encyclopedia of Sandwiches will satiate sandwich connoisseurs everywhere. Susan Russo is a San Diego-based cookbook author, blogger (Food Blogga), and freelance writer specializing in food and lifestyle. The ultimate one-stop shopping guide, The I Love Trader Joe’s College Cookbook finally offers starving college students a welcome relief from fast food fiascos. Designed to help shoppers recognize the best finds and reap the fruits of Trader Joe’s smart buyers, many recipes utilize TJ’s signature products to create unique meals like olive focaccia, frito pie, pulled-pork sliders, and fish tacos, among other things. Andrea Lynn is a NYC-based food writer and recipe developer who has tasted almost every product Trader Joe’s has to offer. Give a new parent the gift of sanity! Parents Need to Eat Too makes it easy for new moms and dads to take care of themselves as well as they’re caring for baby. Every recipe has been tested by a group of more than 100 moms, and every recipe also includes instructions for turning that dish into baby food. The book goes on sale in February, but author Debbie Koenig has created a special holiday offer, available now: She’ll send a free signed, custom-made bookplate and holiday card to anyone who pre-orders the book as a gift. Debbie Koenig is a Brooklyn-based food and parenting writer and blogs at Words to Eat By. Roz Cummins is a Boston-based food writer who specializes in sustainability. She also loves tea and baking. She has worked as an editor, a teacher, and an arts administrator. She is currently working on a book called Golden Afternoons: The Official Handbook of the Society for the Preservation of Ladies’ Afternoon Tea.